Good morning, RVA! It's 32 °F, and today looks pretty OK with plenty of sun and highs in the 50s. Ned Oliver at the Richmond Times-Dispatch looks at the new population numbers released by the Census. 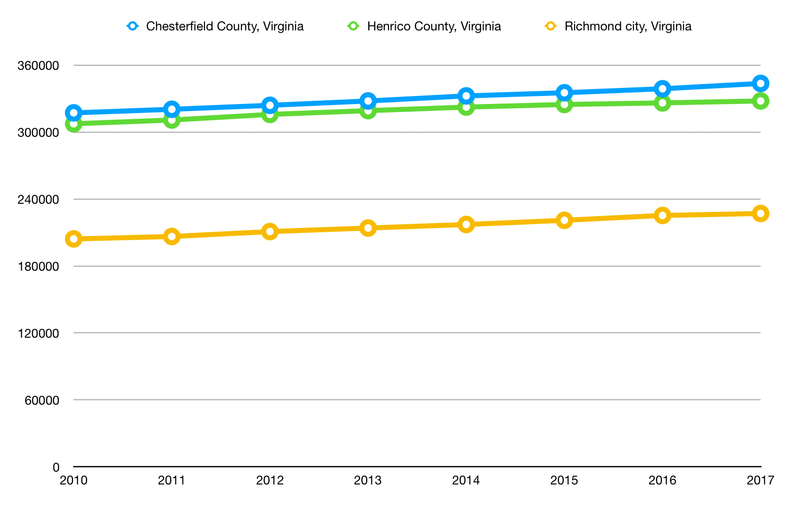 You can look at and download the table of data directly (note that independent cities, like Richmond, are listed at the bottom because Virginia is weird). There are some takeaways, but nothing too earth-shattering. Because I couldn’t help myself, I made this graph of our region’s population since 2010. It’s boring and not super useful, but does show you that this data is super accessible and easy to mess around with. Now, someone go make me a year-over-year percentage population change chart! Michael Paul Williams in the RTD comes out pretty hard against Superintendent Kamras’s new cabinet, calling them “exorbitantly paid lieutenants.” Two thoughts on this. First, we don’t know that all of the cabinet members are getting pay increases to come work for RPS. Three of the six worked for D.C. Public Schools, so we know their previous salaries, but the other three? It remains a mystery. How would the tone of this story change if those folks took paycuts to come work for Kamras in Richmond? Second, these are, at worst, cost neutral hirings when compared to the previous administration’s cabinet! It’s frustrating to see folks keep beating this drum of “wasteful spending” when there’s been no additional spending. I’m with some of the folks quoted in this piece: Let’s give the guy a hot second to assemble his team and get to work. If next year around this time everything’s run off the rails because he’s hired too few people at too high of salaries, then we can get down to business. My dudes! My Favorite Resolution, RES. 2018-R025, the Don’t Close the Sidewalk and Make Me Walk in the Street resolution, was forwarded to the March 26th City Council meeting with a recommendation to approve! Stay tuned. Oh, snap! Zach Irby in the Bristol Herald Courier doing some mythbusting, says those “SPEED LIMIT ENFORCED BY AIRCRAFT” signs are lies! This article answered so many questions that college-aged Ross had while driving back and forth from Blacksburg all the dang time. This new Richmond Living Wage Certification Program looks interesting. Constrained by the Dillon Rule, Richmond can’t institute it’s own minimum wage so programs like this, which highlight employers willing to pay a living wage, are small but achievable steps we can take. WTVR has a few more details. This coming Saturday, March 24th at 10:00 AM join Richmond Public Schools, Liberal Women of Chesterfield County, Richmond Peace Education Center, and a whole bunch of other folks for the Richmond version of March for Our Lives: A Nonviolence March on the Capitol (PDF). The day begins at MLK Middle in the East End for a rally, and then the march heads downtown at 11:15 AM. This is a student-led rally and as such I imagine it will be amazing. Kickers welcome the Indy Eleven to City Stadium in their home opener on Saturday at 5:00 PM. I know the idea of reading someone’s personal FAQ is weird, but this from one of the creators of Cards Against Humanity is excellent and a must-read for anyone with any kind of creative side project. One of the few decisions that you're 100% in control of when you start making games is: you get to decide what you want out of it. Some people make games as a form of art, and "what they want" is simply to express themselves. Those are some of the happiest people I know who make games. Other people make games as a business, and "what they want" is money. Those are some of the least happy people I know who make games. The point is that there's a difference between designing games and making a living designing games. Anyone can make a game. But very few indies make a living designing games. Maybe fifty people in the whole world, probably fewer. Almost everybody who makes games has another job on the side to support themselves. I agree with Derek Sivers who says: "The happiest people I know have a well-paying job and seriously pursue their art for love, not money."